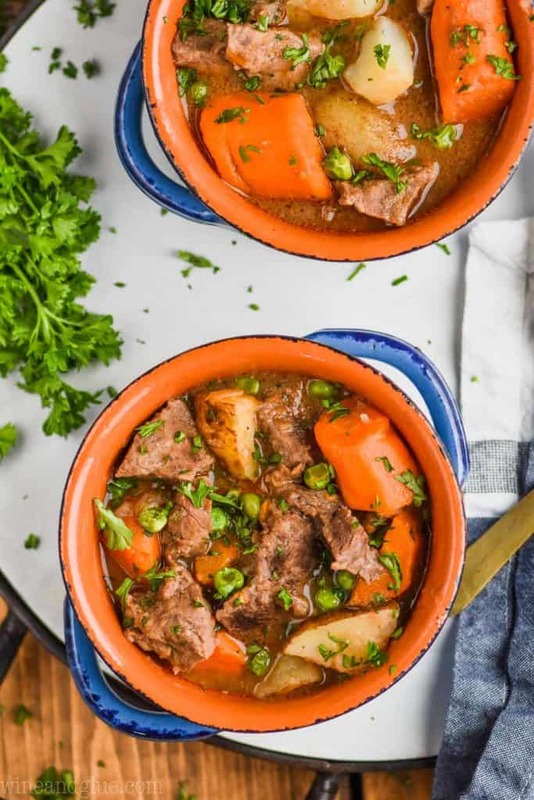 This Instant Pot Beef Stew is the perfect delicious comfort food! 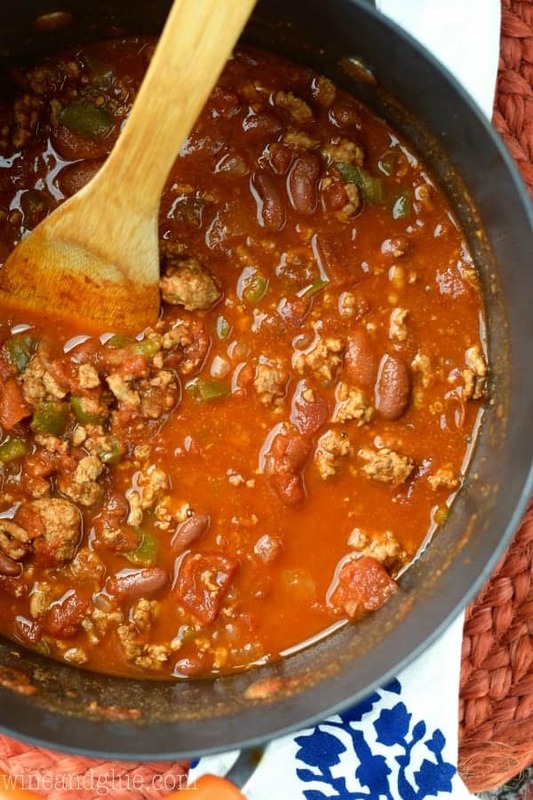 It is like the ultimate winter dish, hearty, warm and delicious. 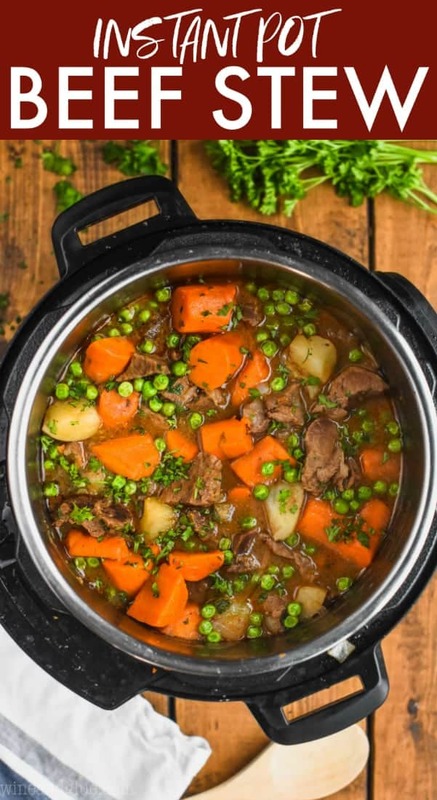 Making this in the Instant Pot cuts the cooking time in half but still delivers you a delicious and hearty dinner your family will be sure to love. When I got my Instant Pot a few years ago, I was absolutely intimidated. I seriously just left it in it’s box and got a judgy side eye from it every time I went into my pantry. It wasn’t until I was on a press trip with Barbara Schieving from Pressure Cooking Today that I got the Instant Pot pep talk that I needed. She wrote this most amazing Instant Pot cookbook (you can read my full review here and get the recipe for this amazing Instant Pot Enchilada Casserole). That book was the thing I needed to figure out, not only how to use my Instant Pot, but to feel confident developing recipes for it. Since then I’ve come up with Instant Pot Chicken Tacos which are simply the best. My family has them about once a week, in fact, they are on the menu tonight (not even kidding). And these Honey BBQ Instant Pot Cocktail Meatballs are my favorite easy appetizer to bring to a party. And now! 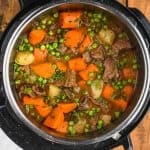 Now I have made you Instant Pot Beef Stew! 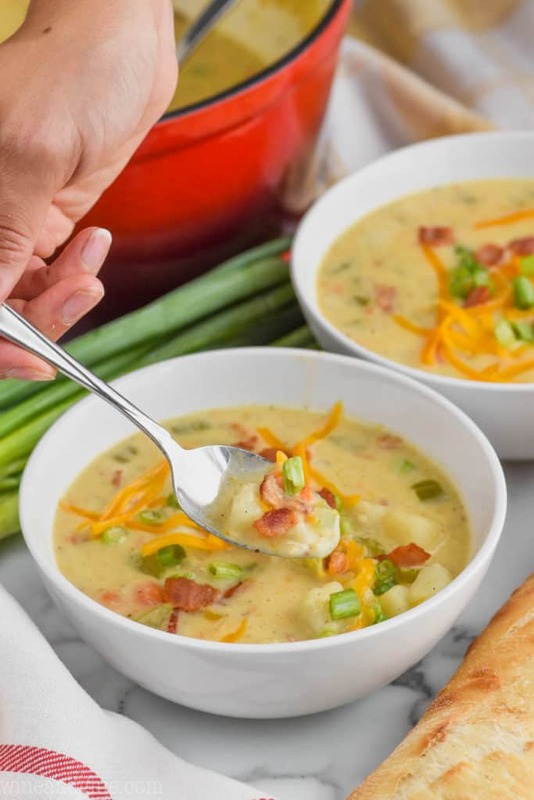 It’s the ultimate comfort food that you have loved your whole life, but with the cooking time cut in half in the pressure cooker. 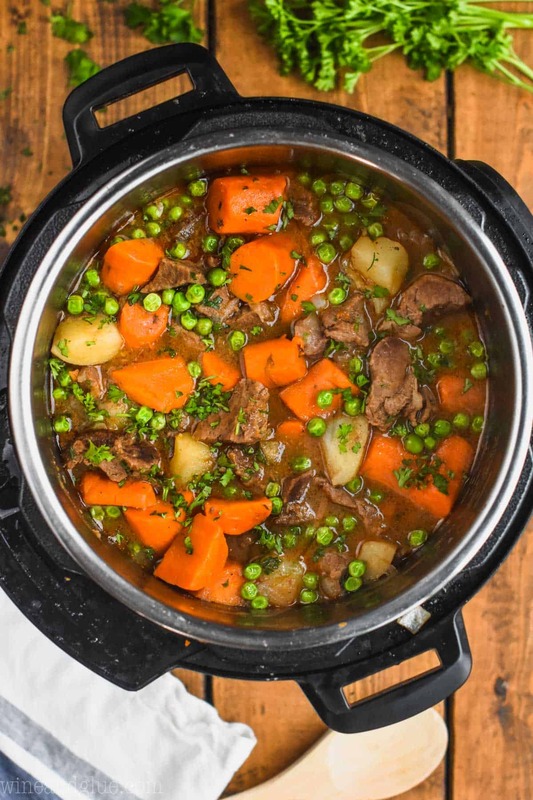 If you need more Instant Pot recipes, this beef stew should be the next thing you make. The first time that I made this recipe, I browned the meat in the Instant Pot on the sauté setting before getting the rest of it going. I’m not going to lie, that makes for a really tender beef stew. However, I didn’t like how much oil it took, and I’m not overly impressed with the browning setting on the Instant Pot. 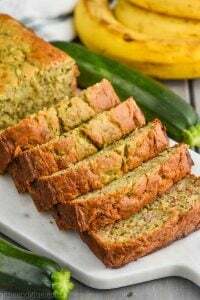 It does not cook evenly across the whole surface and it its such a small surface area I had to do the meat in three batches, making the total time of this recipe almost the same as if I had done it on the stove top. SHOULD I BROWN THE MEAT BEFORE PUTTING IT IN THE INSTANT POT? My solution to this was to just cut the browning out of the recipe and instead whisk the flour into the recipe to thicken it. 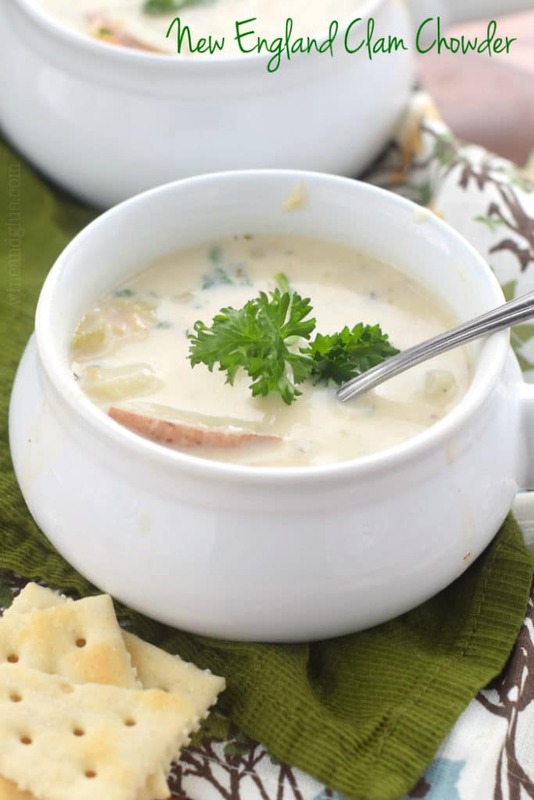 The result was a delicious and thick soup. If you use meat that is well marbled, it should not affect the end result. However, browning the meat before hand does make it slightly more tender. 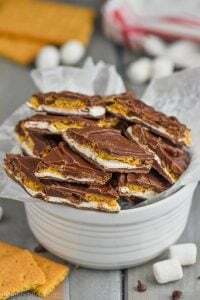 If you want to brown it, I suggest that you toss the meat in the flour called for in this recipe and brown it in a heavy bottomed pot and then set it aside. Do not add more flour in later, just skip that step and add the browned meat at the point written in the recipe below. Whisk the flour, salt, pepper, and thyme together. Toss with the beef to coat it. Add all of the remaining ingredients (except the oil) to the crock pot and cook on low for 8 to 10 hours. As mentioned above, you can brown the meat before adding it, though this is not necessary. I would not recommend browning it in the Instant Pot. Buy a very well marbled stew meat. The butcher at your meat counter should be able to recommend something. You can often buy it pre cut which saves a lot of time. It is key that it is well marbled with fat though, as this will help it stay tender during cooking. Cut your vegetables into one inch pieces. If your carrots and potatoes are too small they will over cook. 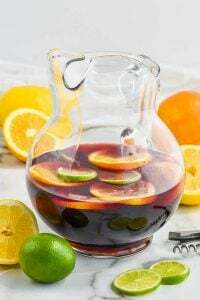 If you don’t often have red wine on hand, I suggest buying a four pack of small bottles to make this recipe. Another great recipe you can use one of the other bottles for is this Red Wine Risotto. 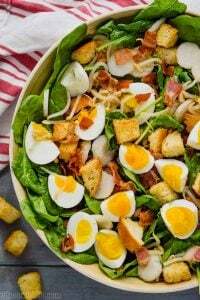 If your family does not use alcohol in recipes, you can cut it from this recipe. I would recommend replacing that one cup of liquid with more beef stock. 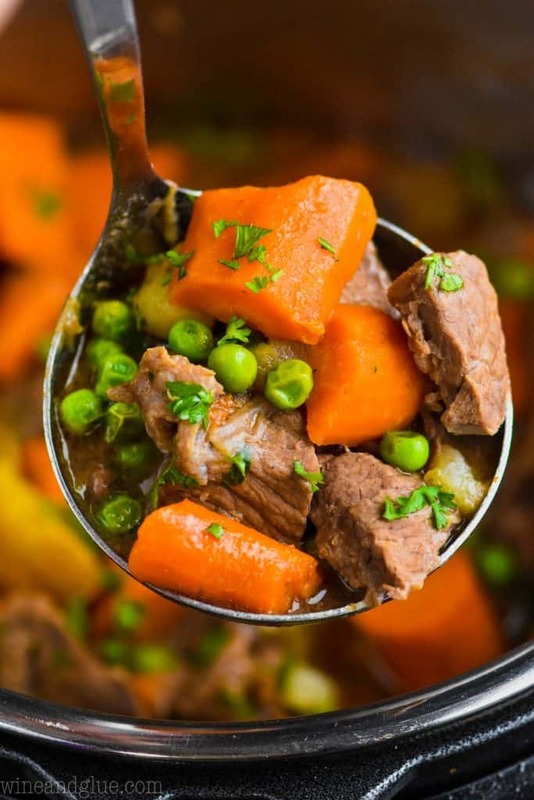 The reason it is in the recipe is to increase the depth of flavor in the stew. However, this Instant Pot Beef Stew will be delicious without it. While preparing your ingredients, turn on your Instant Pot and set it to Sauté, allowing it to heat. Once your ingredients are all prepared and your Instant Pot reads "Hot" add your oil and let it heat up for a minute. Add the onions and sauté for 5 to 7 minutes or until tender. Add in the salt and pepper and stir to combine. Add in the tomato paste and garlic. Stir to fully coat the onions. Stir in the flour. Then whisk in the red wine, scrapping up any browned bits left from sautéing the onions. Whisk in the beef broth. Continue whisking until you do not see any lumps. Stir in the thyme and bay leaves. 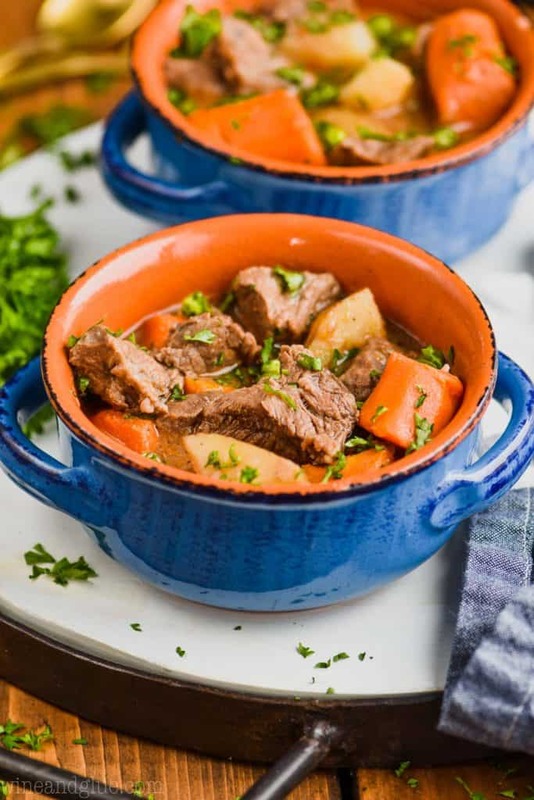 Stir in the beef, carrots, and potatoes. Close the Instant Pot and make sure the pressure release valve (the black knob on the top of your instant pot with words near it that say "sealing" and "venting") is set to sealing. Set your Instant Pot to Manual and the time to 10. Your Instant Pot will do nothing at first, then it will beep loudly and say "On." 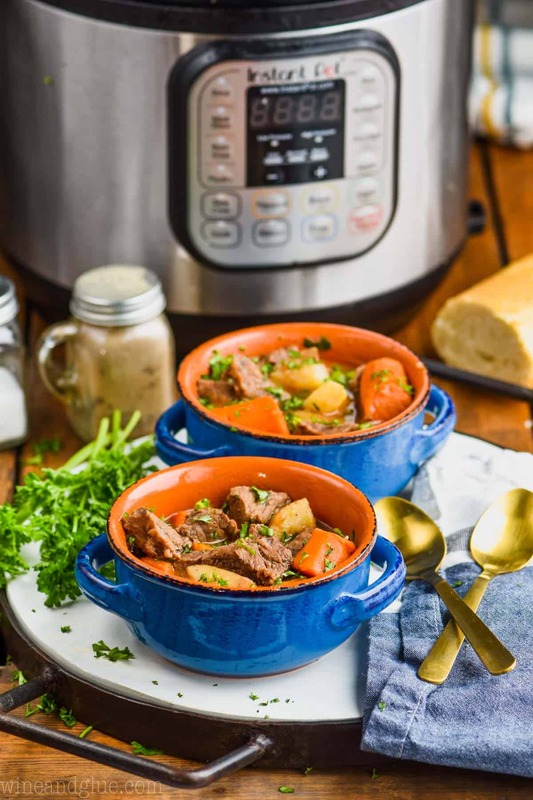 It will take approximately 30 minutes for it to come to pressure and then the time will begin to count down, resulting in about 40 minutes of time in the Instant Pot. After the timer ends, turn the pressure release valve to venting. Allow the float valve to fall (the little sliver part near the pressure release valve). Once it has, open your Instant Pot. Stir in the peas and parsley. Enjoy! Make sure to buy well marbled meat. See the note in the blog post about whether or not to brown. Make sure to not cut your carrots too small. However, you still want them to be easy. Tops of carrots may be too thick and need to be cut in half.